This committee’s mission is to preserve and protect our rich Italian Heritage and Culture. It achieves this by teaching the Italian Language, celebrating events as Carnevale, the Columbus Day Mass and its correlation with the Hall of Fame. The committee is very active in presenting Italian folklore, traditions, history and videos to school children throughout the area. There is E-mail form and a Comment Form on this page where students may ask questions about Italy and locate needed information. All of our events are posted on our Welcome page please check there for all upcoming GRIAA events. Lectures on various timely topics are presented as is information about genealogy and preserving our oral history. We present workshops that revive the Sicilian St. Joseph Altar “Spera” and other Italian traditional foods of the past, and classes learning the art of Palm Weaving are also offered during the Lenten season. The Italian Gallery of the Ethnic Heritage Museum also displays various themes relating to our culture. The Museum is located at 1129 South Main Street. Phone 962-7402 for further information. The Saturday and Sunday nearest December 12th St. Anthony of Padua Church becomes the center for a special Mass honoring Santa Lucia where anyone with eye maladies may receive a special blessing, and during the Christmas season one learns of the “Ceppo” and La Befana stories. By preserving these beautiful Italian traditions one develops a deeper appreciation and understanding of our heritage and culture. Our Italian culture is one steeped in rich history and traditions. That’s why it is important for Italian Americans to keep in touch with their roots and share their pride and heritage. Our association was founded in 1980. Originally known as The Columbus Day Committee, the Greater Rockford Italian American Association (GRIAA) strives to follow our mission given to us by the original Rockford Italian charter members. These members have celebrated the Italian culture and have given meaning to the true roots of our heritage. To promote the Italian culture, sponsor social events and activities, and perform works of charity and philanthropy benefiting the local Italian-American community. A non-profit organization headed and staffed solely by volunteers, GRIAA serves as a conservatory of Italian culture and traditions. It provides the community and opportunity to experience the customs and traditions of Italy first hand by participating in a variety of educational programs and public events provided by our GRIAA Committees. 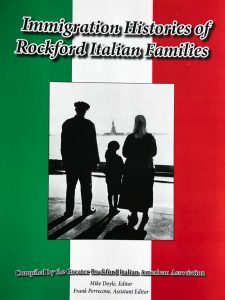 GRIAA’s book, Immigration Histories of Rockford Italian Families, is available at Ferolie & Perrecone, Ltd., 321 W. State Street, Suite 800, Rockford, during business hours, Monday-Friday. Checks are the only method of accepted payment. For mail orders, please send a check payable to GRIAA in the amount of $28 ($8 to cover costs associated with mailing) to GRIAA at P.O. Box 2041, Loves Park 61130. Be sure to include your complete address. Please allow three to four weeks for delivery. GRIAA Collecting Histories for Second Edition of Book. Sicilian Traditions ~~~Share them with us Benvenuti! Bridging the Atlantic: Rockford to Ferentino! The Cathedral of St. Peter School has had the privilege to learn the beautiful Italian Language through funding from the Italian Government under the Culture and Education Committee of GRIAA. This past May, the children were able to show off their Italian to the delegates from the Sister City of Ferentino, Italy. The Mayor, Dr. Piergianni Fiorletta and the other delegates where amazed at the energy and enthusiasm of the children Signora Maria Diemer who teaches Italian throughout the year, had some classes present special programs to the Italian delegation: the Kindergarten sang and danced; the First Grade shared their special thoughts through art work that they presented to the men, as well as reciting their colors and numbers in Italian; the Third Grade really surprised the delegation by singing the Italian National Anthem, called Inno Di Mameli; and the Fifth Grade had a short dramatization on sports in America and Italy. The Ferentino Sister City delegates truly enjoyed the day! Smiles in any language say so much, and they seemed to have a permanent smile while visiting each class. In fact, some of the men joined in the National Anthem, while others joined in the dramatization involving sports especially soccer or calcio the National Sport of Italy. Below, are photos that show some of the children in their activities. The First Grade class with Mayor Fiorletta (red sweater). Signora Diemer (on the right) with the children holding up their “Ciao” art work. Italian Tradition Workshop Recreating St. Joseph Altar Spera! February 12 & 13, 2005 will go down in Sicilian History! Yes, we decided to “bring back” the learning by recreating the beautifully intricate St. Joseph altar “cookie” designs that our grandparents made or had made for our home altars many years ago. Do you remember Miss Margaret Armato, Mrs. Provensano, and Mrs. Altamore and others who were always “there” to make the Spera, Sacred Heart, Peacock and Flower Pots for our home altars? Gene and Shirley Fedeli, culture chairpersons for GRIAA’s Culture and Education Committee along with Rose Ann Scalise Sheridan and Martha and Carl Scalise were the teachers. We had two session on Saturday, February 12th and Sunday, February 13th with eight “apprentices” who recreated those treasures from the past. What a wonderful time we had…kneading and rolling the dough, forming and cutting beautiful designs of our rich and traditional past. If you are interested in learning many of the “almost forgotten” favorite Italian traditions, contact us and learn how you can help preserve our heritage and become a part of the amazing chain of family linked to the past but preserving the future. Yes, this is an important part of our GRIAA mission. We presented a workshop on February 24, 2007 at St. Anthony of Padua Church in Rockford, IL where we helped members of the church learn to make the traditional Pignolatti. This is one of the traditional desserts served at the Sicilian St. Joseph Altar. This workshop extended over two weeks. The first week we made the dough, rolled it out into pencil lengths, then cut them into small pieces. Then they were fried in hot oil until golden brown. The following week we prepared the honey and sugar mixture. The fired pieces were coated, then formed into pyramids that represented the pignola or cone of the old days.